The KEMAR head and torso simulator was introduced by Knowles in 1972 and quickly became the industry standard for hearing-aid manufacturers and research audiologists (visit KEMAR.us to read the full story). The GRAS KEMAR has the same dimensions and acoustical properties as the original KEMAR from 1972 and is 100% backwards compatible. When fitted with pinna simulators, ear canal extension, and Ear Simulator, according to IEC 60318-4 or low-noise, KEMAR closely mimics the acoustic properties of the human ear. A KEMAR equipped with a mouth simulator also mimics the properties of the human mouth, and can therefore be used for testing of communication devices containing both microphone and loudspeaker. A 45BC KEMAR with mouth simulator has the same acoustical properties as a 45BB KEMAR without mouth simulator, except for a minor difference caused by the 45BC KEMAR's slightly open mouth. The 45BC KEMAR meets the international standards as specified by IEC: 60318-7 and ANSI: S3.36, S3.25 and is based on ITU-T P 58. The 45BB KEMAR is identical, but without a Mouth Simulator. Read more about 45BB KEMAR here. The major difference between KEMAR and the standard commercially available head and torso simulators (HATS) is that KEMAR is built on a large statistical research of the average human body – meaning that the KEMAR has the same acoustical properties as an average human, including distinct facial features. Therefore it provides acoustic diffraction similar to that encountered around the median human head and torso, both in the proximity and in the far field. Because of its anthropometric shape it does so more realistically than any other manikin. KEMAR is the only manikin with a changeable ear-to-shoulder ratio simulating both male and female median values. The built-in mouth simulator simulates the sound field around the human head at close quarters and the far field. It is based on ITU-T Rec. P.58. At the mouth reference point (MRP) – 25 mm from the lip plane – the mouth simulator can be equalized to produce a signal from 100 Hz to 10 kHz up to a level of minimum 100 dB re. 20 μPa. The internal amplifier provides 10 dB amplification. If switched off, it is bypassed. The Externally Polarized Ear Simulator RA0045 with the GRAS 40AG ½” Ext. Polarized Pressure Microphone. It requires a traditional 200 V polarization voltage. Connection is via 7-pin LEMO. The Pre-polarized Ear Simulator RA0045-S1 with the GRAS 40A ½” Prepolarized Pressure Microphone. It requires a CCP supply. Connection is via a BNC cable. Both are supplied with an individual calibration chart for the coupler-microphone combination. The 43BB Low-noise Ear Simulator System is based on the standardized IEC 60318-4 (711) Ear Simulator, but the built-in microphone is the 40AH low-noise microphone which has a specially reduced inherent noise floor in order to achieve a large dynamic range. It has a very low noise floor – below 10.5 dB(A) – and can measure sound levels below or close to the threshold of human hearing. For comparison, a standard IEC 60318-4 (711) ear simulator with a GRAS 40AG 1/2" microphone has its noise floor at 24.2 dB(A). Read more about the 43BB here. Twelve (six pairs) different types of standardized pinnae are available for KEMAR. They come in two sizes (standard and small), normal or soft (normal: 55 Shore OO (IEC 60959) and soft: 35 Shore OO), and a VA-style (55 Shore OO or 35 Shore OO). They are designed for an easy push-fit into the ear recesses on the sides of the KEMAR Head. In addition to the standardized pinnae, anthropometric pinnae for KEMAR are available. They have anatomically correct ear-entrance and ear-canal with correct soft ear helix and provide perfect sealing and insertion accuracy for headphones and earphones, and improved collapsibility when testing supra- and circum-aural headsets. The hardness is 35 Shore OO. Read more about the anthropometric pinna here. GRAS ear canal extensions are made of steel or POM and will not deform when testing devices in the concha or devices that are pressed against the pinnae, for example telephone handsets and earphones. This ensures an ultimate interface to the IEC 60318-4 Ear Simulator, resulting in a high degree of repeatability. For testing of binaural hearing aids, ear canal extensions made of POM must be used. Ear Canal Extension Kit with standard pinna-extension tube, Ø 7.5 mm, 8.3 mm long. Standardized according to IEC60318-7. 2 pcs, O-rings included. Ear Canal Extension Kit with tapered pinna-extension tube. Ø 9.85 tapering down to Ø 7.5 mm, 7.4 mm long. 2 pcs, O-rings included. Ear Canal Extension Kit with silicone rubber lining, Ø 7.5 mm, 14 mm long. Standardized according to ANSI S12.42. 2 pcs, O-rings included. Straight Earl Canal Extension Kit for KEMAR, Ø 7.5 mm, 8.3 mm long. Made of POM*. Standardized according to IEC60318-7. 2 pcs. O-rings are included. Tapered Ear Canal Extension Kit for KEMAR. Made of POM*. Ø 9.85 tapering down to Ø 7.5 mm, 7.4 mm long. 2 pcs. O-rings are included. *To obtain the desired effect of non-interference with RF communication inside the head, KEMAR must also be fitted with plastic ear holder plates. These are part of the GRAS RA0251 Retrofit Kit for Binaural Hearing Aid Test. This kit also contains the RA0249 and RA0250 Ear Canal Extensions. The ear canal extensions are for use with the standard pinnae. The anthropometric pinnae seal directly against the ear simulator. The current KEMAR has the same dimensions and acoustical properties as the original KEMAR, but has been developed further by GRAS to meet the industry’s demand for realistic measurements. Today, more than 40 years after its inception, KEMAR can test any device that contains both loudspeakers and microphones as well as perform binaural recordings of product sound and music. At GRAS we safeguard KEMAR's legacy, but are also continuously expanding the range of features and functionalities leading to new applications and uses - without compromising KEMAR's original form. In 2013, KEMAR underwent a substantial rejuvenation that introduced major improvements to build quality, user friendliness and configurability. KEMAR’s previous fiberglass construction was updated to a plastic composite that provides a more user friendly and rugged construction. At the same time, many other improvements were introduced, making KEMAR much easier to configure, calibrate and service. The interior of KEMAR's head can be accessed easily by pushing a button and lifting the scalp. The transducers are mounted and removed by a simple snap fit mechanism. Standard pinnae are push mounted from the outside. The anthropometric pinnae, however, are secured from the inside by two screws in addition to the push mounting. 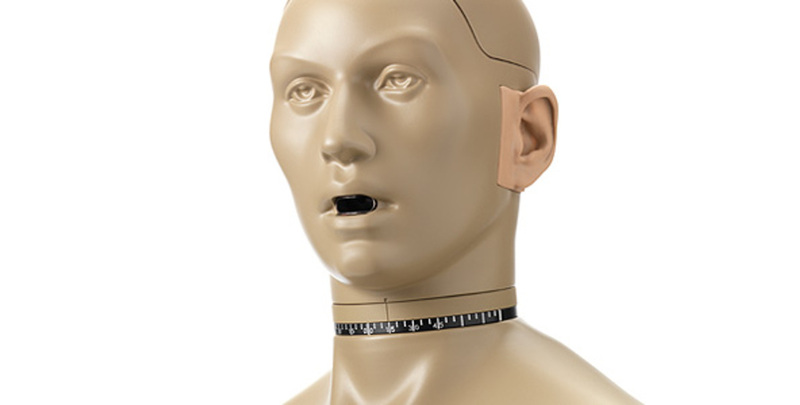 A scale around KEMAR's neck indicates the head angle and allows for repeatable measurements. In most cases calibration can be done from the outside without dismantling the ear simulator(s). However, for some configurations - with microphones and anthropometric pinnae - dismounting of the transducers before calibration is necessary. Mounting the neck is a simple push fit. In most cases calibration can be done from the outside without dismantling the ear simulator(s). All internal cabling is factory mounted. The sockets for connection to ear simulators or microphones are easily accessible at the top of the neck, the sockets for connection to instrumentation are located at the lower back. KEMAR is delivered with two tripod adapters, one for tripods with 3/8” thread and one for ø35 mm loudspeaker stands. The 45BC KEMAR Head and Torso, non-configured is a KEMAR without any application specific accessories. As such, this KEMAR is intended for customers who want to reuse accessories already in their possession. But the non-configured KEMAR is also the core of all configured 45BC KEMARs. 2 anthropometric pinnae, with anthropometric concha and ear canal. A mouth simulator with built-in power amplifier. With these accessories, KEMAR can be configured for a wide range of both standard and special applications, making it the most versatile manikin for in-situ anthropometric testing today. For headset testing, 6 different configurations are available. For testing headsets with 60318-4 ear simulators and standardized pinnae, a LEMO version and a CCP version are available. They are configured with 60318-4 ear simulators and large pinnae 55 Shore OO. Thiese two configurations are for testing in accordance with the relevant standards. For headset testing with anthropometric pinnae, two configurations with 60318-4 ear simulators and anthropometric pinnae are available. The anthropometric pinnae introduce a number of advantages over the standardized pinnae when testing insert types of transducers and supra-aural headsets. With the anthropometric pinnae, you get improved fit, seal and repeatability when testing in-ear devices and more realistic collapsibility when testing supra and circum aural devices. For low-noise testing of ear and headphones, a two configurations with low-noise ear simulator system(s) and anthropometric pinnae are available, both for single channel and dual channel testing. The combination of a special low-noise version of the ear simulator and the anthropometric pinnae introduces major improvements to fit, accuracy and, repeatability. Also, the low- and high frequency performance is improved when testing insert type ear and headphones. This KEMAR can also test at or below the threshold of human hearing. The low-noise artificial ear is available in a LEMO version only. For telephone test, two configurations with the45EA Handset Positioning System are available. With this, very realistic in-situ measurements on mobile telephones as well as conventional handsets are possible. The 45BB KEMAR is a KEMAR without Mouth Simulator. 12 different configurations are available. Read more here. KEMAR is made of components from our standard portfolio and are all manufactured of high-quality material and branded parts that were chosen and processed to ensure life-long stability and robustness. This enables us to offer 2 years warranty against defective materials and workmanship. Exceptions: Microphones included in KEMAR as for these our normal 5 year warranty apply. The warranty period for cables is 6 months. Maximum power, pulsed 2 sec. GRAS Sound & Vibration reserves the right to change specifications without notice. O-ring kit for KEMAR, 2 pcs. The Kit includes Ear Holder Plates, mounting bolts and the RA0249 and RA0250 Ear Canal Extension Kits. Included items are made of POM, Nylon and Teflon. GRAS Sound & Vibration reserves the right to change accessories without notice.